After yesterday's short visit, today I would like to guide you through some of those places that when you visit Antigua, everybody will tell you, they are a must! Let us begin this exploration by walking along the Calle Real which will take us right under the famous Arco de Santa Catalina (Arch of Saint Catherine). The first yellow building with a balcony that you see to the right is the original Fonda de la Calle Real restaurant that I mentioned yesterday. Just before the arch, in the corner building (that is more than 300 years old), is the enchanting Posada de Don Rodrigo hotel, which has a lovely courtyard where especially on weekends, there is a marimba ensemble playing the traditional Guatemalan music. 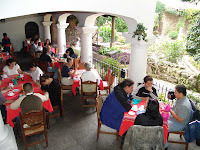 The restaurant of this hotel is another place that I would highly recommend: the setting is lovely, the staff will make you feel at home, the food is very good, and if everything I just said is not enough, you are going to see one or two ladies making tortillas in the traditional way and in front of an equally traditional clay comal. Some times, they are making black corn tortillas, which are so delicious that I am going to confess that in one occasion I sneakily grabbed a bunch, covered them with the green napkin on my lap and put the package into the pocket of my jacket, got rid of the empty basket and with the most innocent expression I asked a waitress for a basket with tortillas. Later that day I traveled to Costa Rica with my stolen black tortillas! At the footsteps of the arch in front of the Posada de Don Rodrigo hotel, we will be able to explore some of the remains of the old Saint Catherine Convent, now converted into a cozy hotel that contributes to preserve the building and beautiful gardens. 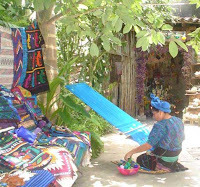 Passing the arch to the right, we will see a blue large building-warehouse where we will find a wide variety of handicrafts and to the end, in a small patio, usually there is a lady showing the art of weaving in a traditional back strap loom (telar de cintura). 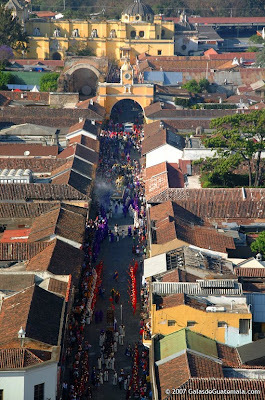 The massive yellow building we can appreciate at the end of the Calle Real, is La Merced Church, which in colonial times was also a convent. Its construction began in 1548 but its present form was designed in 1767 to withstand damaging earthquakes. The intricately-patterned yellow and white baroque-styled facade features important sculptures such as Our Lady of La Merced and Saint Peter Nolasco (one of the founders of the Royal Order of Our Lady of Mercy of Redemption of the Captives). Inside the ruins of the once-attached monastery stands Antigua's largest fountain "Fuente de Pescados" (Fountain of the Fish) with a diameter of over 24 meters. And just to give you an idea of how beautiful and majestic this place is, I am sharing with you a colorful photo of the exterior and another one of the fountain in the ruins of the convent, both from galasdeguatemala.com, and the last one, a gorgeous view that I captured a couple of years ago from the terrace of the restaurant El Sereno. By the way, after our short yet meaningful excursion, would you be in the mood for an upscale meal? Please say yes and join me to savior one of the most outstanding kitchens in Antigua Guatemala: El Sereno, which is located very close to La Merced in a magnificent and well preserved colonial house. The food here is an exquisite eclectic fusion of Guatemalan, Asian, and Italian influences. Literally, to die for!